Home » American History • Canadian history • Does History Matter? Tobacco is in the news again. Outlets from the New York Times to The Daily Show with Jon Stewart have reported how children–primarily Hispanic and as young as twelve–work in the tobacco fields of North Carolina, Virginia, Tennessee, and Kentucky. 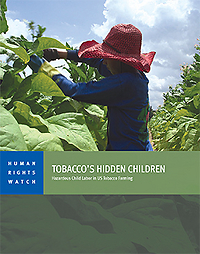 The news reports drew on extensive research conducted by the organization Human Rights Watch, released as Tobacco’s Hidden Children: Hazardous Child Labor in United States Tobacco Farming. (See the full report here). As Human Rights Watch noted, these young workers toiled daily for twelve or more hours in all weather conditions and were subject to all the hazards of tobacco labour, including back pain from harvesting, risk of injury from the sharp tobacco knives, and exposure to the pesticides sprayed on fields. As someone who researches the early (pre-World War II) development of tobacco cultivation in Canada, Green Tobacco Sickness largely eludes my archives. One can read hundreds of newspaper, government, and industry reports from the period and have no idea that such an illness existed, though references to the fact that tobacco was widely seen to be a difficult crop to work with are easy enough to find. A National Film Board documentary released not long after World War II, The Back-breaking Leaf (1959), provides a hint of the illness. It notes that some workers (mostly adults in the documentary) hired during harvest season could not manage to keep up and collapsed. The documentary attributed this to exhaustion caused by the hard work that priming (removing leaves one by one) demanded. But, it is possible that at least some of these workers were not simply exhausted: they had succumbed to Green Tobacco Sickness. While the specifics of Green Tobacco Sickness in the fields can be difficult to find in the documents, references to child labour in the tobacco fields are relatively abundant. For instance, a collection of interviews of Essex County, Ontario farmers indicate that by about twelve, children were expected to take on more roles in tobacco cultivation. They would help top, sucker, and harvest the crops. George Laycock, who had recently arrived from England, recalled working in tobacco on Pelee Island when he turned 11 (Laycock is a pseudonym; the actual names of the participants in this project remain protected until 2015). According to one report some 20,000 women and children worked the tobacco harvest during World War II when male labour was scarce. In the 1920s and 1930s, when Norfolk County was becoming the centre of Ontario’s tobacco production, immigrant families from Belgium, Hungary, and elsewhere relied heavily on the work of their children to help make ends meet. Some did better than make ends meet. The Canadian story offers some examples of what tobacco cultivation could bring to immigrant families, though the public costs of tobacco always loom over these stories. Hard work meant hundreds of immigrant families were able to settle permanently in Ontario and acquire their own farms. While most immigrant families never managed to acquire a farm (or even sought to), it remained a distinct possibility for some. By working towards establishing a family farm, some children were able to turn their summer toil into an apprenticeship that allowed them to establish or inherit the prosperous tobacco farms that dotted southern Ontario in the postwar period. In the Daily Show report, Paul Hornback, a Kentucky State Senator, acts as the representative for tobacco farming interests (perhaps ‘fall guy’ is the more accurate term). He insists, as did grower representatives in response to the Human Rights Watch report, that most farmers provide plenty of opportunity for rest and shade for their young charges. Hornback also alluded to his own past experiences to impress that he felt working the tobacco fields was instructive and meaningful: “When I was 7 years old, I was wanting to work. I was wanting to do what the men were doing.” This is, in many ways, a variation of the tired ‘If I can do it, so can they’ line that informs many arguments of the privileged. Of course, Hornback is not the only representative of tobacco farmers. The current head of the Tobacco Growers Association of North Carolina acknowledged the risks of nicotine poisoning for farm workers and claimed that very few members of the association hired people under 18. Yet the children who work on farms today enjoy neither the opportunities that Hornback had nor,even those of immigrant children during the interwar years. The Human Rights Report record makes this clear. The remaining U.S. tobacco farms no longer operating under the auspices of the federal quotas and price control system established during the New Deal. Recently, they have undergone an accelerated process of consolidation. The family tobacco farm is disappearing. As tobacco farms become larger, the need for more hired labour relative to family labour increases. A recent study by anthropologist Peter Benson also noted that the end of the price control system has led to growing pressures on farm owners to lower costs. In this context, the rewards of child labour, however modest, have largely evaporated. Young tobacco workers earn only a minimum wage, and the report indicates that most used their wages to supplement the family income. Here, we see a parallel to earlier farm family labour, but again, the potential benefits of their work today are distinctly underwhelming. Despite the considerable hazards and limited benefits of children working in tobacco, the practice persists and continues to be free from federal oversight. In Canada, where there are very few tobacco farms remaining, most labourers arrive under the Seasonal Agricultural Worker program. While this program is subject to its own shortcomings, including low wages and lack of job security, it excludes people under 18 years of age. In the United States, the New York Times recently reported that intensive lobbying from farm organizations and pressure from southern legislators has prevented any forthcoming legislation that would ban tobacco farms from hiring youth under 18. This is a tragic outcome. Without federal regulation, youth in American tobacco farms will continue to bear the risks of working in the field, but without hope for any of the potential rewards that earlier workers enjoyed. It is a grim situation indeed when people could expect better in the 1930s. Jonathan McQuarrie is a PhD Candidate at the Department of History, University of Toronto. He tweets about things historical and not at @jrmcquarrie. Did you ever stop to think that maybe the children actually wanted to work in the field? Or maybe that they enjoyed it?